You are here: Home / Family Fun / Bookshelf of a 4 year old? Bookshelf of a 4 year old? Someone has been raiding Daddy’s bookshelf. You have a genius on your hands there! Brilliant! 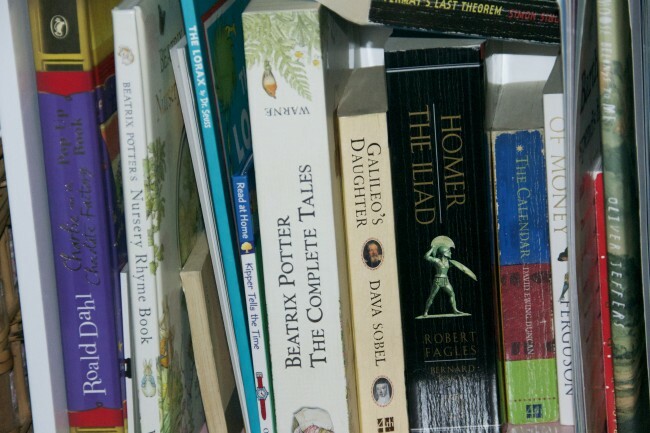 There isn’t a copy of the Illiad in our house, but I aspire to a child with one on their bookshelf! She could have my Waterbabies if she wants, but it’s not quite in the same class! Brilliant! Noah (or me!) would not cope with the level of literature here and Kerry would have put the books in height order and all the right way up!